Across the street from my house are two apple trees. Every fall they are covered in apples. For the past two years, they have housed bird nests where the neighborhood children could catch a glimpse of baby birds. But fall is a long way off and there is no sign of a bird's nest in the branches yet. 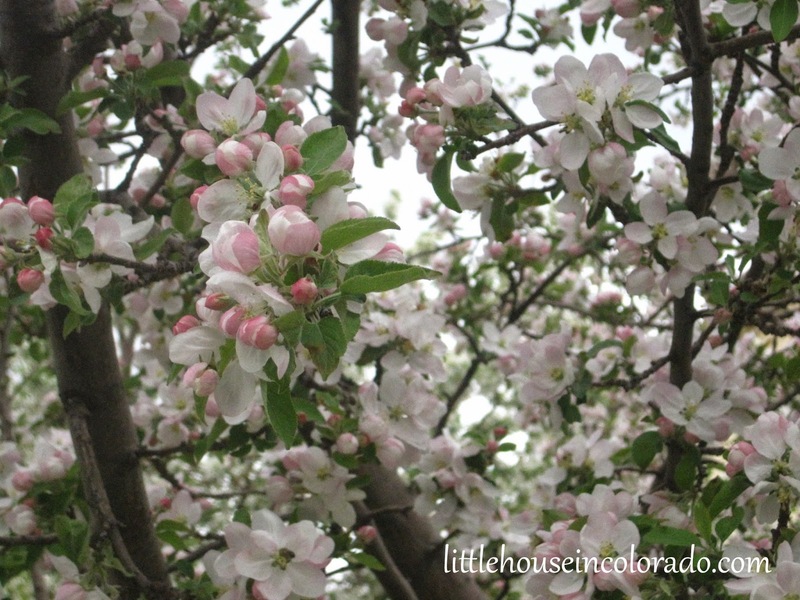 However, every spring these trees greet the season one after another with gorgeous blossoms! 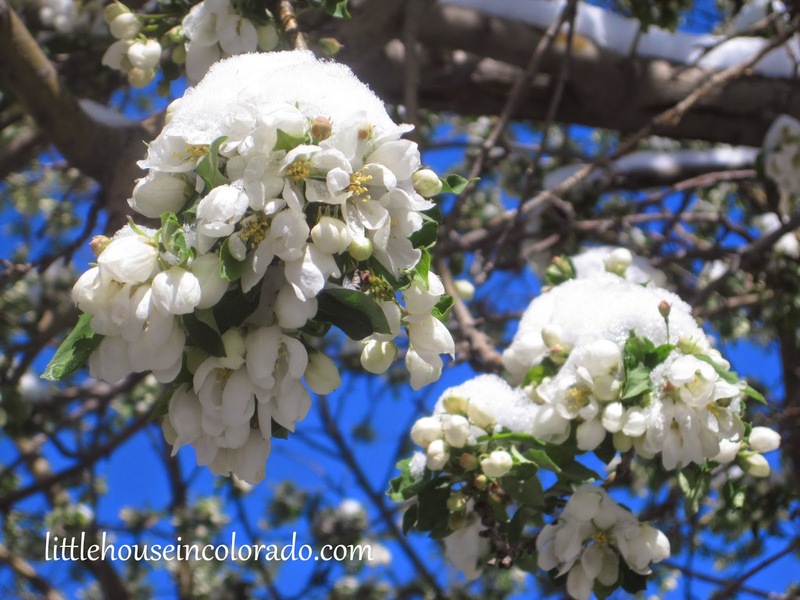 In mid April, the first tree to bloom got a nice coating of snow. The weather didn't seem to affect the tree much. In fact, I think it may have helped. The blooms just got bigger! Once the blossoms from the first tree started to fade and the branches began to turn green from the new leaves, the second tree began blooming. The scent from these trees is heavenly! The Girl and I would just stand beneath them and breathe in deeply while the Boy watches us from our front porch thinking we've lost our minds. It has been just over 2 years since my family first began our "debt elimination" journey. My extended family may be getting tired of hearing about it. Every time they ask "what's new?" I answer with an update on the most recent debt we've paid off. But within the walls of our little house, we are constantly talking about our budget and the progress we're making. The "Pickles" now start their requests off with "When we get our new house can we have..." because no big requests are going to be granted before then. Too many families believe debt is just a "part of life". That's the way it was for my family. We had a lot of debt. It was "normal" to have a balance on credit cards. It was okay to finance a car. It was fine to finance a house for 30 years or take out a student loan (or two or three) as long as the payments were manageable. We had much more debt than we realized. But we were able to afford the monthly payments on everything so we never thought we had a problem. And the saddest part is that surprisingly, we were "normal". So there we were, living our lives thinking everything was great and we were doing well. I had a full-time job that I loved while Mr. LH finished grad school so he could do the job he loved. We took a wonderful celebratory mini vacation in Roanoke, Virginia the weekend Mr. LH graduated. Then the following week the company I worked for closed. Unemployment only paid me half of what I used to bring home. Our savings account took a huge hit covering the difference. Mr. LH, with his new degree, was able to secure a new job but it meant we had to leave North Carolina and move to Colorado. We had to sell our home in a depressed market. Thankfully, we had enough in savings and enough money coming in that we never fell behind in our bills. You would think this whole experience would have rattled us enough to start fixing things then. But once Mr. LH started his new job in Colorado, we slid back into our normal, comfortable routine of making payments and using credit cards. Since we were still paying the mortgage on the house in North Carolina, things were pretty tight. That means we weren't being frivolous, but the amount of debt going on to the credit cards every month was getting larger and the payments we would send every month to pay it were getting smaller. Still, we thought as soon as our NC house sold, we could buy another house and move out of our rental. Our house in NC had been on the market for almost a year by then and had been under contract several times. We had no idea when it would sell but we wanted to be ready to move into our own house once it did. So in late summer of 2011, MR. LH and I met with a Realtor, to see what homes were available in the area. There were several we liked but we still couldn't commit to anything just yet. The NC house finally sold 2 months later but instead of reaping the rewards of having lots of "equity" in the house, we had to contribute money to the closing. Housing prices had dropped so low that we lost all the equity we thought we had accumulated. Even so, we were so thankful that house was no longer a worry. Our savings account had been depleted from the mortgage payments we had kept up throughout the year the house had been on the market. We wouldn't have been able to make the next mortgage payment if the house didn't sell. We didn't have a penny left for a down payment (and the days of "no money down" loans disappeared when the housing market crashed). Our house hunting came to a disappointing, embarrassing, abrupt end. Still, we continued to live as we had always lived. Nothing changed. In fact, we breathed a little easier now that we didn't have that NC mortgage looming over our heads. Six months later, in April 2012, our landlord “requested” a lease extension of 12 months. The extension came with an rent increase as well. We thought again about buying a home. We had gotten used to home-ownership and had not exactly enjoyed renting for the previous year and a half. The house needed so many repairs done and it seemed the owner just didn't want to do any of them. Rental prices in this area were out of control. A "cheap" house in a low rent area was still $1300 a month. So many people had lost their homes in the real estate crash and as a result the demand for rentals remained extremely high, even with rents increasing every year. Our options were to either turn in the signed lease or give an evacuation notice within 2 weeks. A mortgage payment would be considerably less than our rent but we weren't in a position to buy yet. Our rent, even though it was going up, was still towards the low end of the rent scale for the area so finding someplace cheaper to rent would be next to impossible. It was at this point that we became angry. We were angry about the economy. We were angry about the rent being raised on a house that had so many issues. We were angry we couldn't afford to move anywhere else. We were angry we had stupidly gotten ourselves into this mess. We wanted to kick all our bills to the curb. We were ready to get out of debt. We extended our lease and made a goal to do everything possible to rectify our financial situation. We didn't want to be sitting in the same house a year later signing another lease extension. I took a look at our assets…ALL of them. Surprisingly, we had just under $10k in assets. Now, that didn't include our vehicles, but it did include our depleted savings accounts, IRAs and cash value life insurance plans. For a couple of people our age, $10k is very very sad. But it was encouraging too because before I pulled all this information together and looked at it, I thought we were completely broke. I then dug into our income vs. expenses. It had been a long, long time since I looked in-depth at our financial situation but I dove right in and pulled out every bank statement, every receipt and every bill we had received since January 1st of 2012. We had a ridiculous number of credit cards. Five. Who needs five credit cards? The balances would be paid down…then an "emergency" would come up…or Christmas…and the balance would swing right back up again. All but one of them had a balance. The interest alone on that balance was enough to make me bang my head on the desk over and over in despair. We also had FOUR student loans. Those included the most recent ones for Mr. LH's graduate degree. It seemed our first order of business would have to be eliminating all the debt BEFORE we attempted saving for a house. There was no sense in buying a house only to lose it later because of mounting consumer debt. The dream of a new home was already starting to blur. I now knew our original 1 year goal was very unrealistic without some windfall of money coming our way. We needed to lower our expenses to help get rid of our debt. We were living beyond our means. There was too much being added to the credit cards every month. The credit cards were going away. The credit cards were stuffed into a sealed envelope and placed in a locked box in the house. That would keep me from having them with me when I went out to do the shopping. They were later moved to the safe deposit box and removed and shredded as they were paid off. Dining out: It cost us anywhere from $30 to $50 every time we dined out. The dining out year-to-date total (as of April 2012) was over $500. Most of the time, we went out to eat because we had nothing planned for dinner. With careful meal planning, we could eliminate those restaurant meals. Our grocery bill would increase, but eating at home only costs a tiny fraction of eating out, especially when my son could wolf down a full adult pancake breakfast (and still be hungry) and my daughter had a habit of ordering the $4 macaroni and cheese kids plate everywhere we went. Note: We still go out to eat once in a while. However, those trips are reserved for birthday dinners (and only if the trip is specifically requested as a gift and then budgeted as a gift) or if we receive a gift card for a restaurant. Groceries - Saved $1200 to $1800/year: Our monthly grocery bill for a family of 4 was averaging about $500. I knew I could lower that amount. I read a blog where a family of 8 had, at one time, a monthly grocery bill of $400. So my family of 4 should be able to make it on $200 a month, right? We weren't going to stretch it that much, but cutting out $100 to $200 a month on groceries would be great, even though we would also be dining out less (or not at all). We started out with a $350/month budget and after about a year of struggling with that amount, I changed the grocery allotment to $400/month. This covers food AND toiletries. Re-evaluate the phone bill - Saved $240/year: We were still under a 2-year contact for our home phone/internet service, but I called the company anyway, told them I was looking to cut my expenses and wanted to take a look at my phone options. Once that phone call was finished, my bill was reduced by $20 a month and I didn't lose any services. Our 2-year contract for our cell phones had expired. We needed to take a look at new cell phone plans available to see how we could save money. Our cell phones were already the basic bottom-of-the-barrel phones with no data plan. We didn't text anyone so we didn't pay additional for that either. But we did pay for 2 cell phones and I never used mine. Ever. Re-evaluate the trash bill - Saved $36/year: When we lived in NC, there was only one trash service. You either paid it or made frequent trips to the dump. We were limited to two trash cans (which was no problem), they did not pick up bulk trash, yard waste or recycling. When we moved to Colorado, we had several trash companies to choose from. The one we chose was the cheapest, had great reviews and offered the same services as everyone else – unlimited trash, yard waste and bulk pickup – all for the same price we were paying in NC. Recycling was extra. We were very happy with that company but then a new garbage man came to town. They offered all the same services AND recycling for almost $3 less a month. We switched. It was a good decision. We pay $36 less a year and get recycling for free! We continue to use them 2 years later. Automotive (gas) - Saved $300+/year: Thank heavens the cars were both paid for and, for the time being, doing well. We had to replace some tires and get a full tune-up earlier in the year, but otherwise, our auto expenses were only for tag renewals, regular maintenance and gas. To lessen gas expenses, I walked to school with the children once in awhile – though not as often as I could have. I also planned for multiple errands to be done during the same trip. Most days, the van never left the driveway and was only used on weekends for family outings. I used to have to fill up the gas tank twice monthly. That dropped to about 2 - 3 times every 2 months - or saving half a tank to a full tank of gas every month. Since Mr. LH drove the most, he used the more fuel-efficient car. It just happened to also be the one that would get him to work safely in the snow as well. Electric, gas and water: Unfortunately, there is only one game in town for electric and gas suppliers. It’s the same thing with city water services. There wasn't much we could do except what we'd been doing…watch the thermostat carefully (since we have no air conditioning, the thermostat stays between 58 and 60 degrees year-round), keep air filters changed regularly, monitor all electrical appliances and conserve, conserve, conserve. The city didn't allow rain barrels for harvesting water, but we made sure there was an aerator in place on the faucets, limited shower times, minimized lawn watering (the lawn was all weeds anyway) and made sure all laundry loads were full-sized. We also started to hang-dry a lot of our laundry. The low humidity here really assisted in drying wet clothing quickly. I thought it interesting that right around this time, both children were studying conservation in school. The Girl came home telling me how long my showers should be and The Boy brought home a package he received at school from the utility company full of CFL bulbs, an air filter monitor, a digital thermometer, a glow nightlight and all sorts of stickers and magnets reminding you to “turn off the computer” or “turn off the light”. Trying to determine how much we've saved on our utilities is difficult. Even as we started to consume less electricity, water and gas, the costs for these utilities also increased. So we're still paying about the same as we always have. I budget for the high end (the highest utility bills we've had) and if our monthly bill happens to be lower, we throw the difference at our debt. Car Insurance - Saved $36/year: I had been with the same car insurance company since I got my driver’s license years and years (and years) ago. There may be better rates out there, but we have very good rates and no other company has made me feel confident in them enough to make me switch. Although the car insurance didn't change, I did talk with my insurance company about lowering premiums by raising my deductibles. In our case it didn't make much of a difference in the premiums. We started paying bi-annually for our auto insurance and annually for our renter's insurance to avoid the $3 per month service fees. 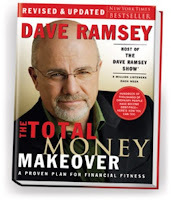 I reserved a copy of The Total Money Makeover by Dave Ramsey from the library. I was able to pick it up a few days later and I immediately started reading it. It didn't take long to finish. This book makes sense. The goals are attainable and the stories of people who have worked the plan and succeeded are very inspiring. After going through this book, I was able to put together a workable plan. The following month, we were already seeing progress. We paid off one credit card and 2 smaller student loans. And then the first of what would be several financial "emergencies" hit us. Both "Pickles" needed braces. Thankfully, we had dental insurance to help lessen the blow but even after the insurance paid their portion there was still a hefty balance due. We rolled the braces into our new budget and tightened our belts a little more. As of the date of this post, it has been just over 2 years since we started our debt-elimination process. We still have just over a year to go before all the debts are paid. We will still need to save a large emergency fund and a hefty down payment for a house. It's been a long road so far but we're making great progress. In those two years, all of our credit cards have been paid off as well as two student loans and two sets of braces for the "Pickles". Anything new that comes up (like car repairs or school expenses) are paid for with cash so it doesn't increase our debt. 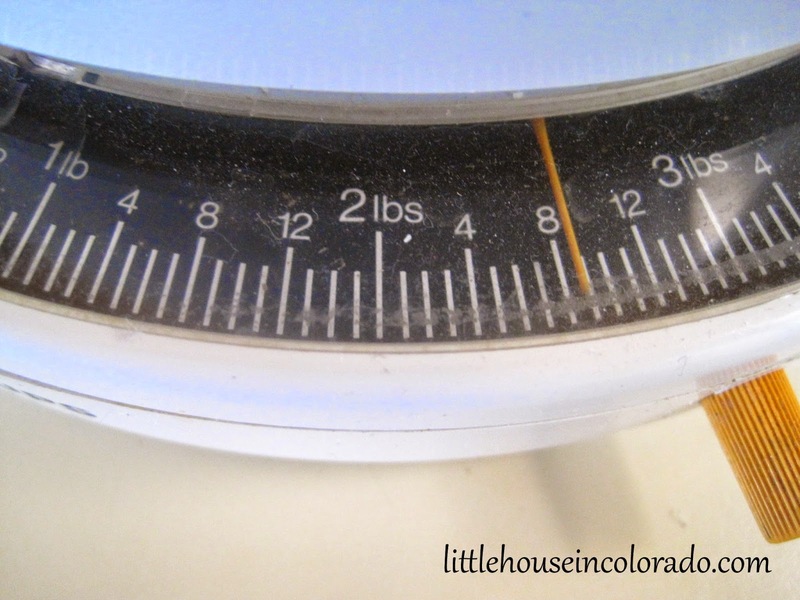 In Part 2 of this mini-series, I'll explain the steps we took in lowering our grocery bill. We're not eating steaks, but we're not living on just beans & rice or ramen noodles, either. The Girl had to get braces again. I thought she would be disappointed since she already went through this before to fix her front teeth, but apparently I was wrong. She was actually excited about it. Then the orthodontist announced she would need to have four teeth removed. I expected this. You see, she inherited my mouth. The Girl has a smallish mouth that doesn't have enough gum space to neatly house all of her current and future teeth. She got braces put on all her teeth except the ones being pulled. 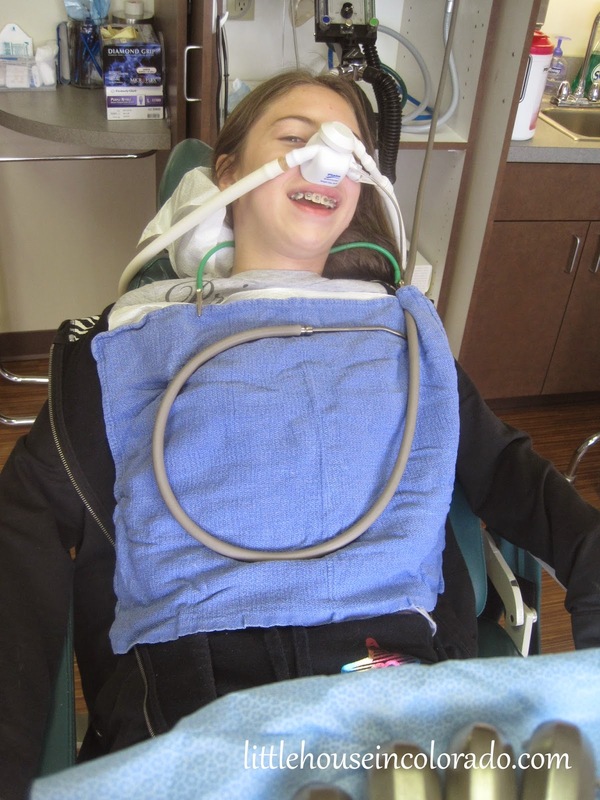 When we went into the oral surgeon's office to have her teeth removed, naturally The Girl had all sorts of questions about laughing gas and "how much will it hurt?" Her doctor and his assistant were wonderful with her, answering all her questions and telling her exactly what she could expect. They even told her throughout the procedure how everything was progressing. The Girl did beautifully. In fact, aside from a few pricks she felt from the initial numbing injections, she didn't feel a thing. I, on the other hand, felt queezy after watching them pull the first tooth and had to turn away and look out the window. I watched the llamas in a field across the way for the remainder of the procedure. I can't believe there were actually llamas out the window! 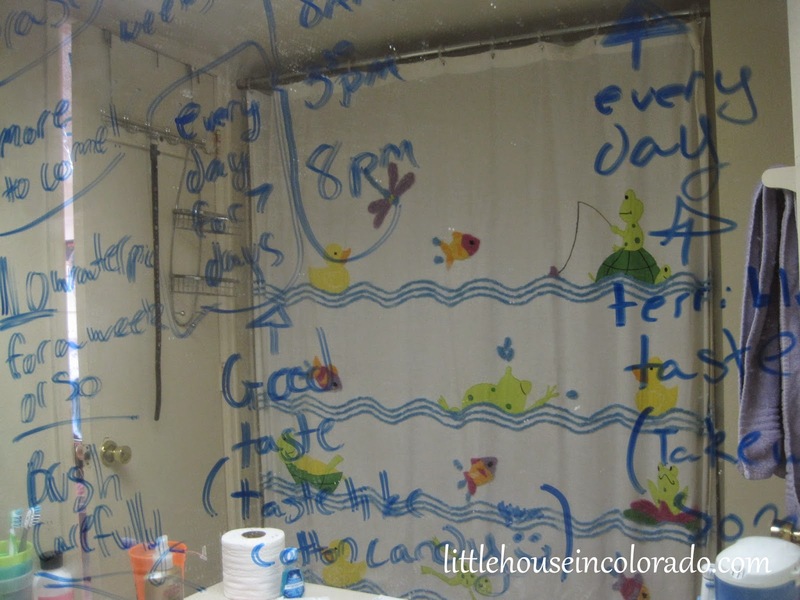 Of course, The Boy had to say something about how the bathroom now smelled caustic from the dry-erase fumes, but Mr. LH was proud of all the notes and mentioned it looked like The Girl had managed to spell most everything correctly. Anyway, it's been several days since the procedure and The Girl seems to be doing just fine. She went to school the following day and hasn't had any problems with eating and drinking. Thankfully, she also hasn't had much discomfort. She hasn't mentioned putting her teeth under her pillow. I think she wants to keep them. I used to be very good about remembering appointments. I found I am better at it during the school year (when I am constantly checking the calendar) then I am during the summer. After missing two separate appointments within a 2 week time period last summer, I knew I had to figure out something to help me remember. I don't have a smart phone that I can set to remind me and MS Outlook reminders won't do me much good unless I am on the computer. So after re-scheduling those missed appointments, I wrote the new appointments on my calender like normal. The the night before the appointment, I wrote it on my bathroom mirror with a dry-erase marker. Just "Dentist - 8am". I see it first thing in the morning. Mr. LH sees it too, so he reminds me. If it's an appointment for one of the "Pickles", I write it on their bathroom mirror as well so they can accept some of the responsibility for getting to the appointment. This system has worked so well for us that now, we use the dry-erase marker on the mirror all the time for appointment reminders. This method works better for me than just writing it on the calendar and we haven't missed an appointment since we started doing it. 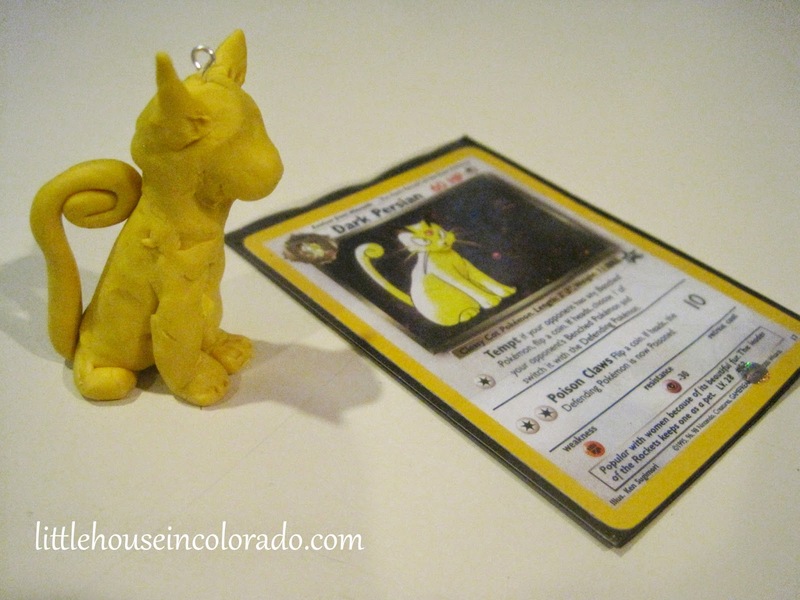 Back in February, The Girl was watching YouTube videos about her Littlest Pet Shop pets and Pokemon and somehow or another wound up watching videos on making charms out of clay. 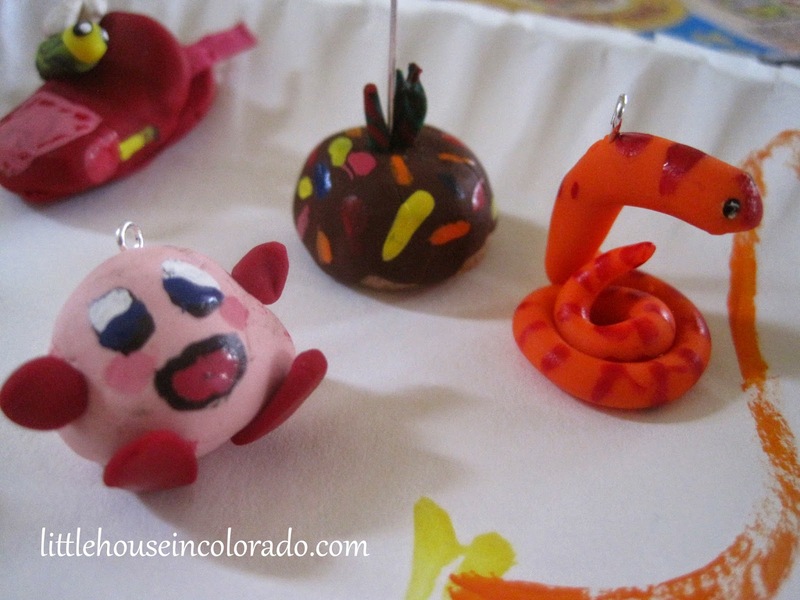 This intrigued her and she made a list of supplies she would need: polymer clay in various colors, eye pins and paint. 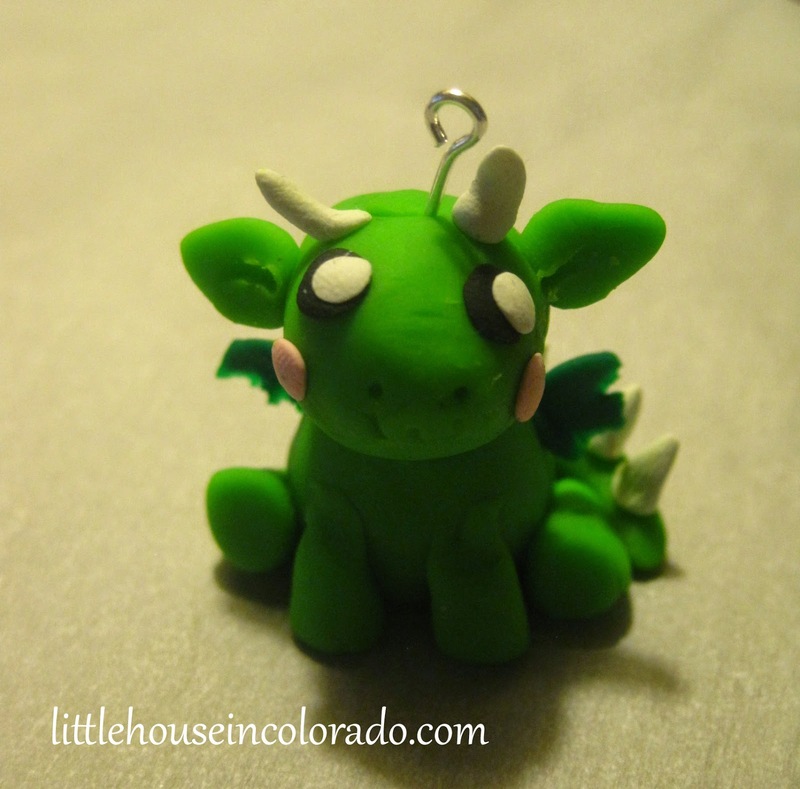 We got her a small multi-color package of Sculpey clay, dug the eye pins and paint out of my craft supplies and she got to work. Her latest creation is a "Daddy" charm. 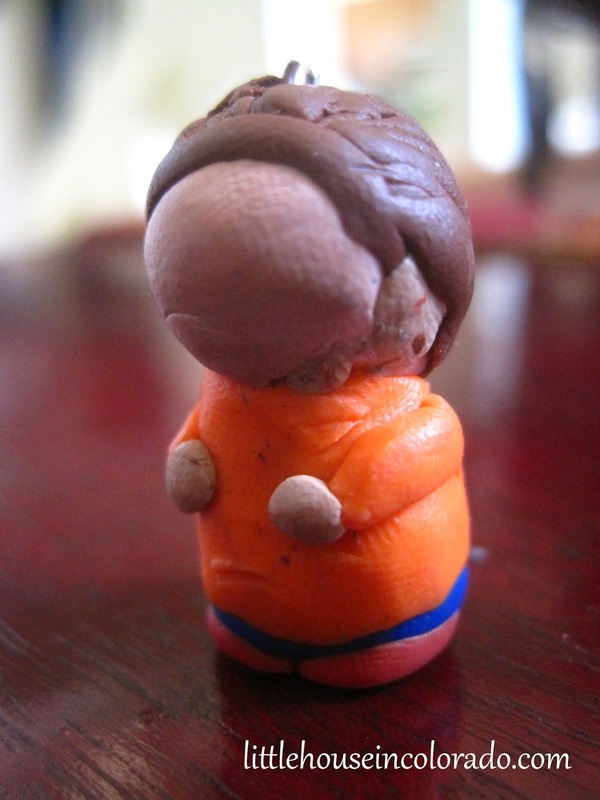 It's only about 1 inch tall. She'll paint the face on once it's baked. 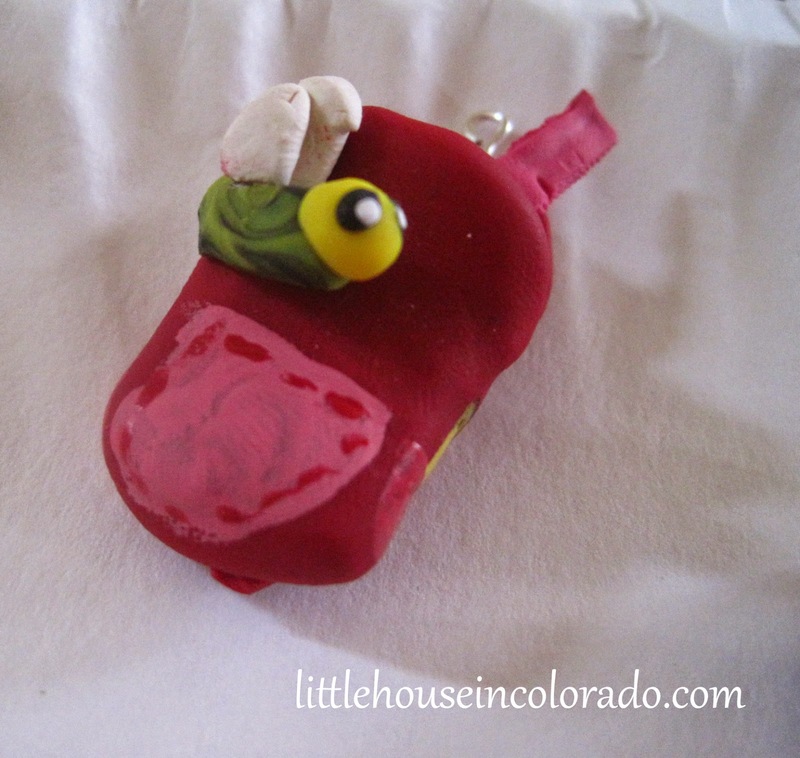 I love that the Sculpey stays soft until it is baked. She is constantly bouncing from one project to the next and we don't have to worry about clay drying out in the meantime. She just creates several, makes changes as needed and then we bake a bunch at a time. Aside from needing to use some of my personal stash of white Sculpey, The Girl is still using the original multi-pack clay we got her. It really goes a long way! She's made about 30 charms, big and small, finger puppets and even tried to make her own Littlest Pet Shop pets and accessories. It's probably the best $7 we've spent on her. I love soft, chewy cookies. 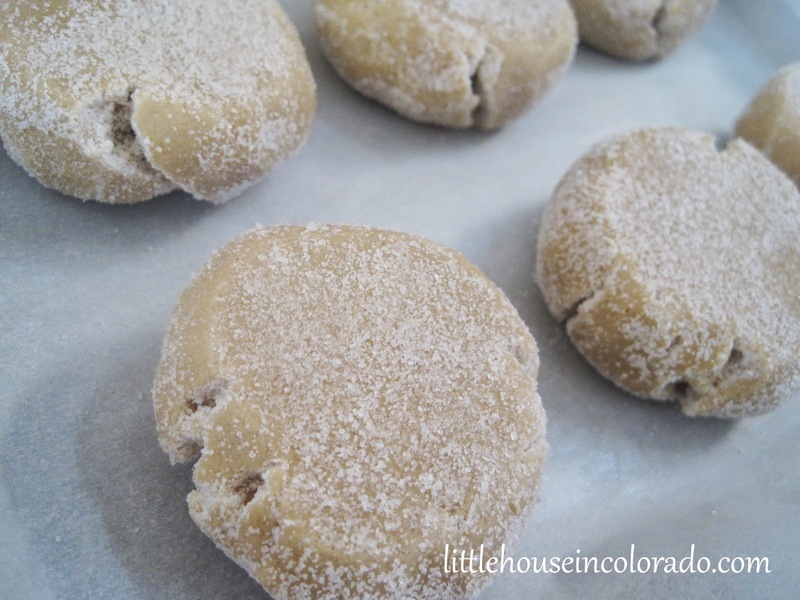 If a recipe claims to make soft chewy cookies, especially with a crisp outside, I'll give it a go. That's how I came to make these Big, Soft & Chewy Peanut Butter Crinkle Cookies by Averie Cooks that I found on Pinterest. These cookies are huge! They are as big around as a softball. Even the name is a mouthful! Each ball of dough was almost a full 1/4 cup so it makes sense that the recipe only makes 12 big cookies. 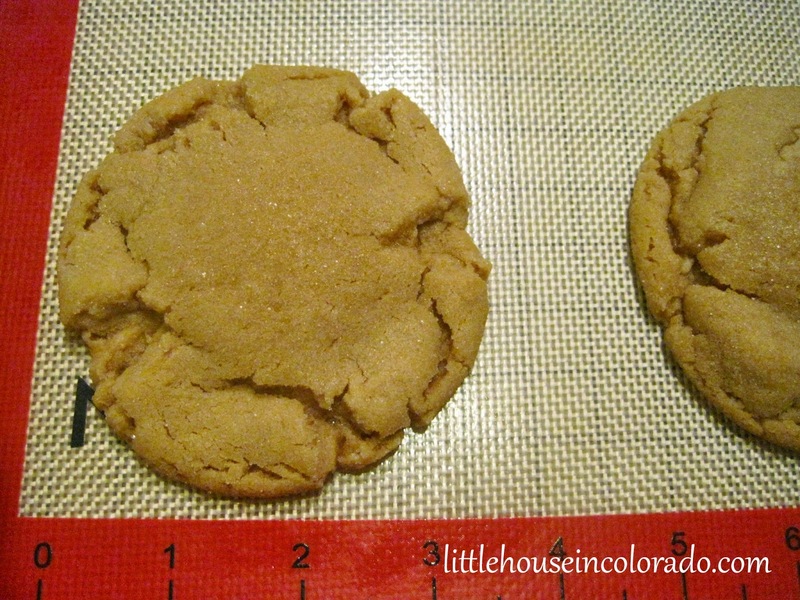 Big or not, 12 cookies won't cut it in this household so I double the recipe when I make them. Baking details? I mush the balls into fat discs before coating in sugar. Then I bake them on a silicone sheet on a dark baking pan for exactly 12 minutes (when I use shiny pans, they take longer to bake). You definitely need to let these cool a bit before you try one. Otherwise the cookie will just fall apart when you try to pick it up. 10 minutes or so seems to be enough time. Mmmm! So yummy! The outside is just slightly crispy (probably from the sugar coating) and the middle stays nice and soft. 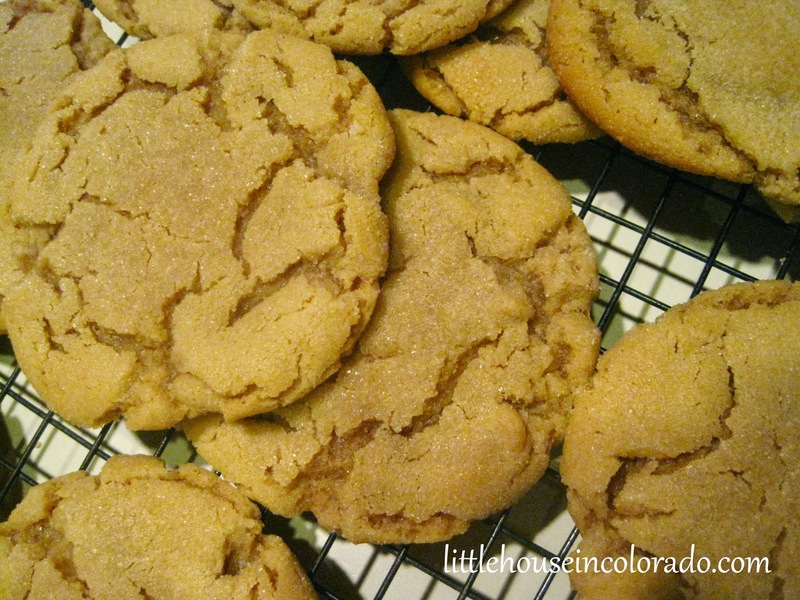 Even Mr. LH, my non-peanut butter cookie eating husband, said these cookies "rocked"! You can grab the recipe over at Averie Cooks. Now that my zucchini stash from the freezer is all used up, my family has been missing the usual loaf of zucchini bread we would have hanging out in the kitchen ready for snacking. Bananas never last long enough in the house for us to have any over-ripe ones for banana bread. Pumpkin Bread, while yummy anytime of year, requires pumpkin (which, even canned, can be incredibly expensive out of season). And both of those options are best with nuts. The "Pickles" are both in braces (The Girl just started round 2 of her braces) so nuts are out of the question for the foreseeable future. 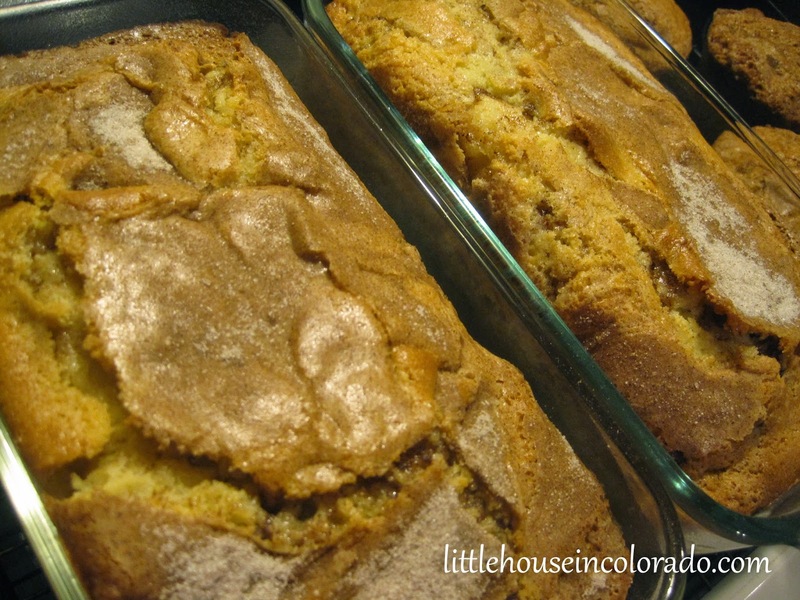 I had experimented with Amish Friendship Bread a couple years ago. It was very good but after several months, I became pretty slack about keeping up with the starter. We haven't had Friendship Bread since then. Thanks to Pinterest, a recipe was brought to my attention for Amish Cinnamon Bread without using a starter. The original recipe didn't specify how large the loaf pans should be. The first time I made this, I used two of my 8.5" x 4.5" Pyrex loaf pans. You need to use something larger. One of the pans OVERFLOWED and the other almost spilled over, too. I even needed to bake it for 30 minutes longer than the recipe called for. The bread still tasted fantastic and Mr. LH and I ate almost an entire loaf in one night! 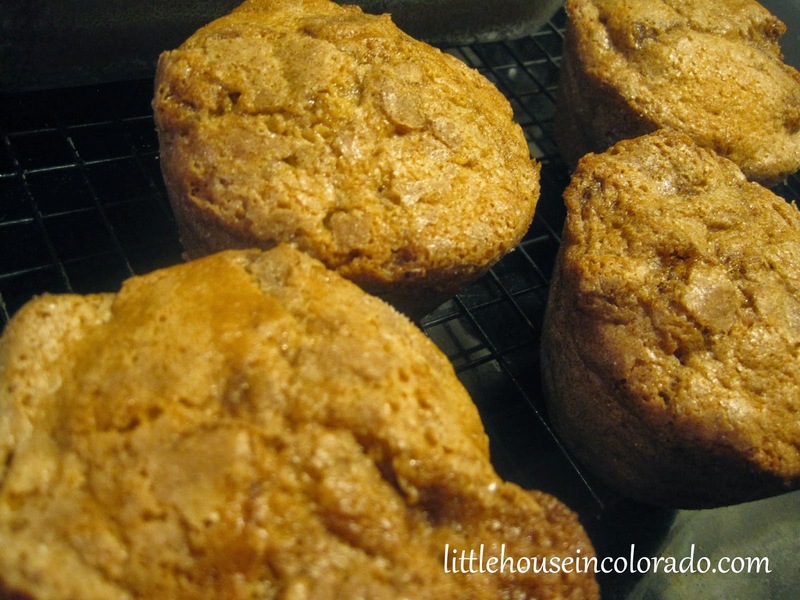 The second time I made this bread (just a few days later), I made four "Texas-Sized" muffins with the batter and then split the rest of the batter between my two loaf pans. It still rose significantly, but it didn't overflow this time. I also still needed to bake it for an additional 20 minutes. (This may be due to the higher altitude). While it's not as wonderful as our go-to zucchini bread recipe, and it's not *quite* like Friendship Bread, it's still very, very good. Whenever we run out, Mr. LH asks for more. It might just be our off-season snack bread recipe from now on. 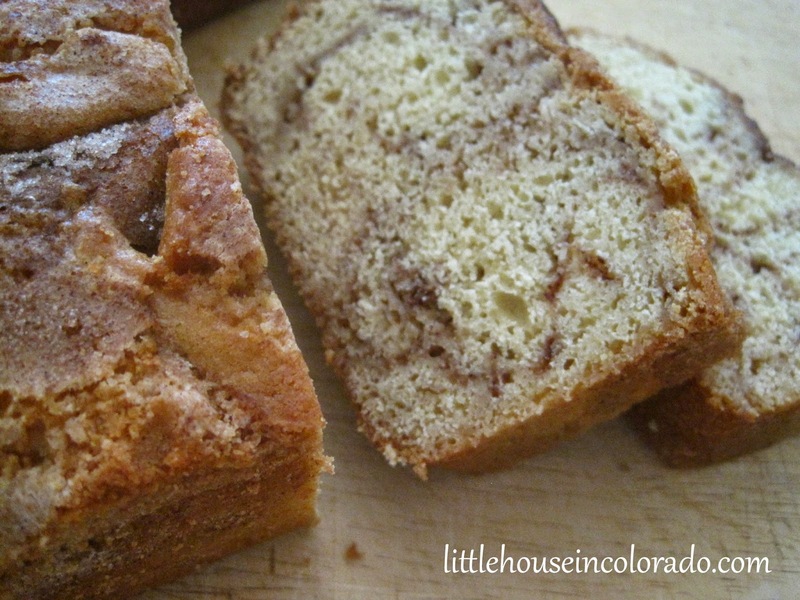 The recipe for Amish Cinnamon Bread can be found on Redfly Creations. Would You Buy 25 Lbs Of Flour? Costco sells 25 lb bags of bread flour. People look at you funny when you leave there with a huge bag of flour and your kids in tow. I know. I bought one. People looked at me funny. I even heard the jokes about how many cakes I must be planning to bake. I guess only businesses buy those bags of flour. Maybe so, but the $7.19 price tag won me over. I never before thought we went through so much bread flour! 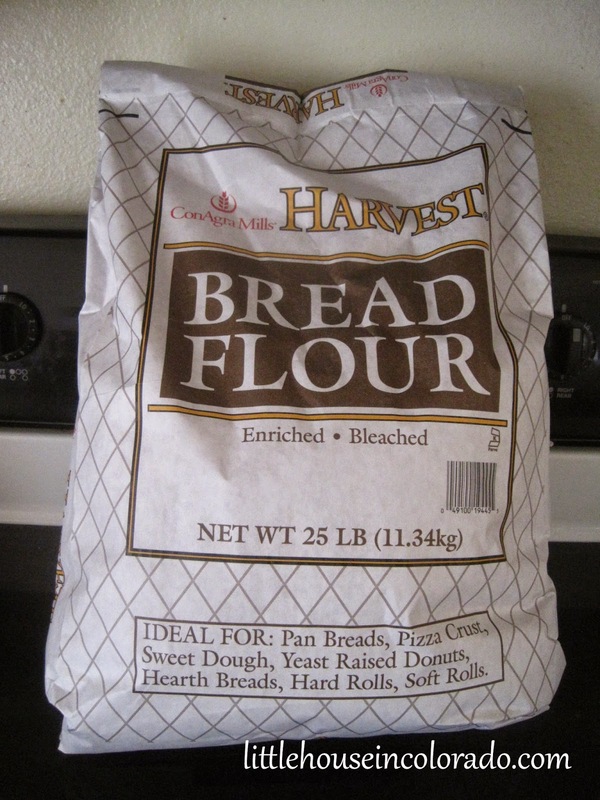 I had previously been buying my bread flour at Albertsons - three 5lb bags at a time for $1.99 each. That was the store brand and was the cheapest I could find (Walmart was the only other store in this area that carried a generic bread flour). Buying it that way, in 5 lb bags, it didn't seem like a ton of flour, but when you add it up over the course of several months, it is. About 12 weeks after I purchased our first 25 lb bag, out supply had dwindled down to only about 2 pounds. It was time to get more. I don't store my flour in it's large bag. I divide it into smaller, more manageable packages. The first time I split up a bag, I use whatever was available. That meant half-gallon jars, quart jars and gallon ziploc bags. The gallon-sized bags held more than my large half-gallon jars but I didn't want to keep having to buy more bags. I was trying to save money with this bulk flour purchase. I also wanted to find a low waste/zero waste solution. I decided to use only the large half-gallon jars. To make things easier, use a canning funnel to fill up your jar. 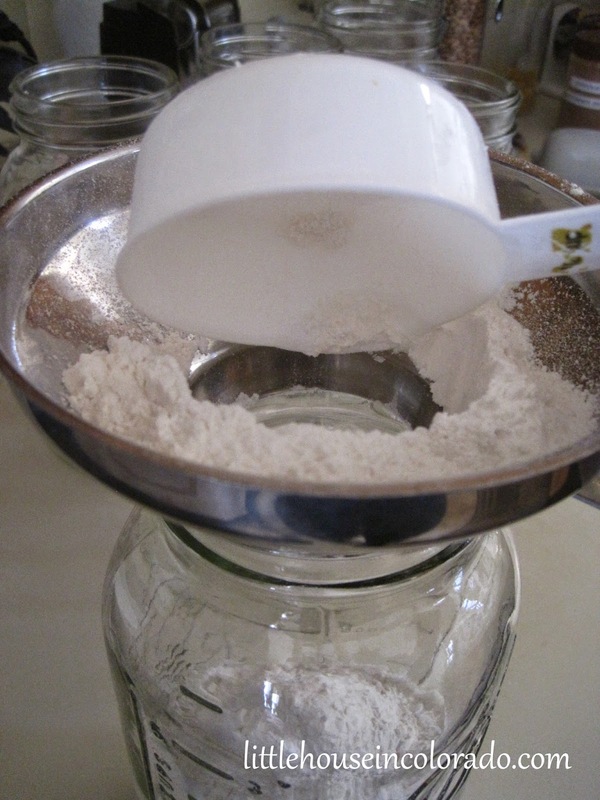 Each half-gallon jar holds at least 2 1/2 pounds of flour - more if you spend time tamping it down (which I didn't do. That means, for one 25 lb bag of flour, you would need ten jars. I only had eight jars available but I also had to fill up our main container in the kitchen. These containers are made by Snapware. They have silicone seals to keep them airtight. These are the older models with the flip top. I absolutely love them! Once all the jars were filled, I capped each one and rotated them through the deep freezer for a few days each to discourage any bugs. I've heard a bay leaf can accomplish the same thing but I haven't tried it and I didn't have any bay leaves on hand. Since I knew we would use up this flour within about 3 months, I didn't bother prepping it for long-term. 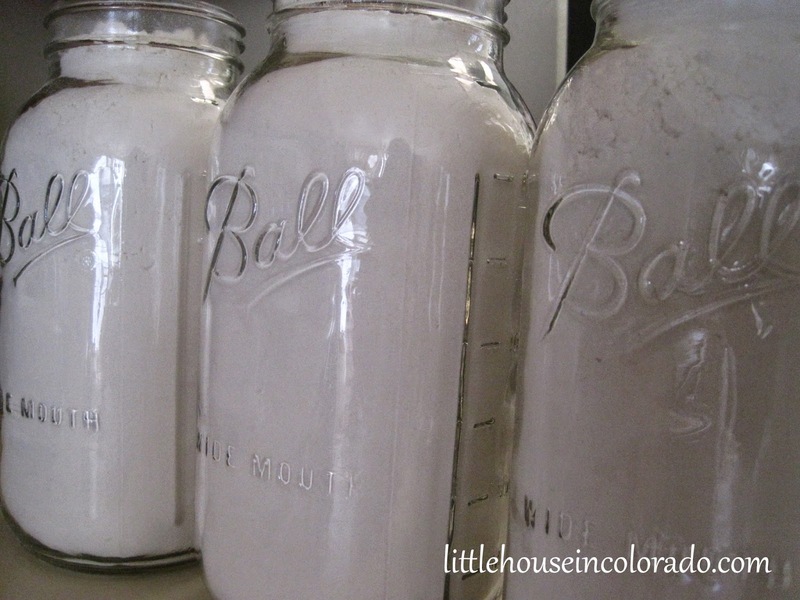 If it will take you a long time to use up your flour, you may want to place a couple oxygen absorbers in the top of each jar before sealing them. 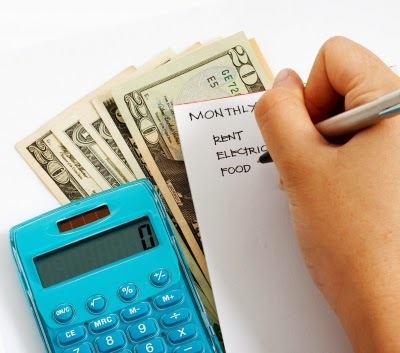 This may seem like a lot of work just to save a few dollars, but over the course of a year, saving a few cents or a few dollars here and there with multiple products really adds up to a lot of money! I received a notification last week from Microsoft. They were ending support for Windows XP on April 8th, 2014. My computer was the only one left in the house that still ran the XP operating system. Normally, I wouldn't care. XP has been very good to me throughout its many years. I haven't had issues with it as I have with more recent Windows versions. I would just keep happily using it. However, since security updates for XP would also be ending, I couldn't just turn a blind eye. Luckily, I have another machine. It is almost as old but it's not quite the senior dinosaur in the house. It runs Windows Vista. For reasons even I can't now explain, I packed it up and have had it in its box for over a year. This weekend I pulled it out and cleared it of everything unnecessary (mostly the countless games Elder Boy had continued to load onto it). Well, my software wouldn't work. It was glitchy. It was slow. Apparently, it's because it was Vista. Once again, I started moving files...this time to the external drive to stay for awhile. I decided to go ahead and upgrade this newer machine to Windows 7. I plan to give the old XP machine an upgrade to Windows 7 too, but I may just wait several days to recuperate from this latest upgrade. I think it's funny how much faster it runs now that I've removed all my files and folders from it. Though it's not in her room, The Girl is thrilled we now have two working computers in the office. She can now do her homework and play her games while I work instead of us having to share one machine. The "Pickles" used to go through two whole boxes of instant oatmeal every week. I don't know how they did it. I was always full after one package, but they would consistently have two or more every morning before school. Finding a way to make my own "DIY Oatmeal Packets" is wonderful for my food budget. It also means I know exactly what is in the oatmeal. Since the "Pickles" have each always eaten two packages of instant oatmeal in a sitting, I made my "packets" double-sized. However, the instructions below are for single sized packets. 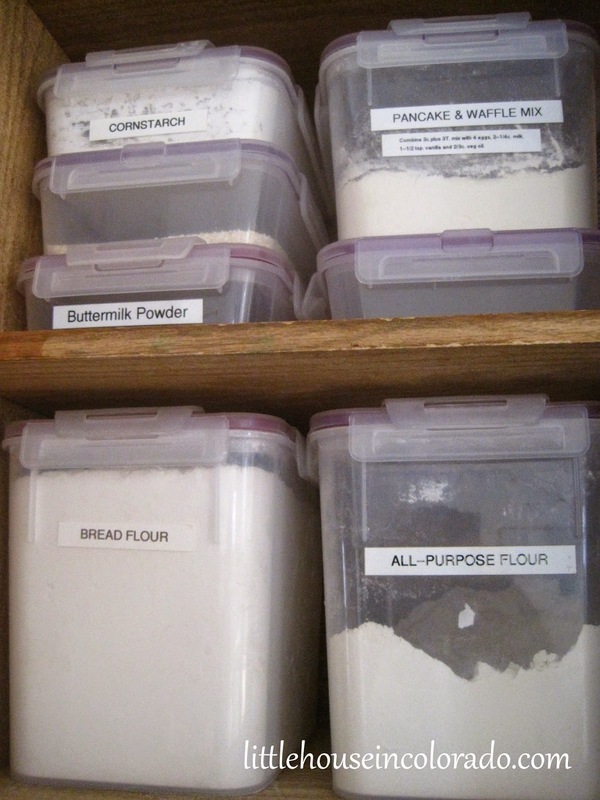 Container - I put my "double-sized" portions in the small 1/2 cup sized Glad-ware disposable containers. I have also successfully used zipper top sandwich bags. Place all ingredients into your container and seal. To make your oatmeal using the boiling water method, empty your oatmeal into a bowl and add 1/2 cup boiling water. Stir. To microwave your oatmeal, empty your oatmeal into a microwave safe bowl. Add 2/3 cup water. Microwave on high for 1 - 2 minutes. Stir. It helps to make these "assembly line" style. That way, in just a few minutes you can have a dozen or more oatmeal packets made and ready. We have mixed everything into a large container before with the thought of scooping it out a portion at a time but the ingredients didn't stay evenly mixed so we switched back to individual portion cups. We have also considered adding dehydrated fruit to the oatmeal packets but have not tried it yet. I think it would be great with dried apples, peaches or blueberries. It's not the first time this has happened. April arrives with pretty blossoms finally brave enough to start showing themselves. And the next morning, they were covered in snow. 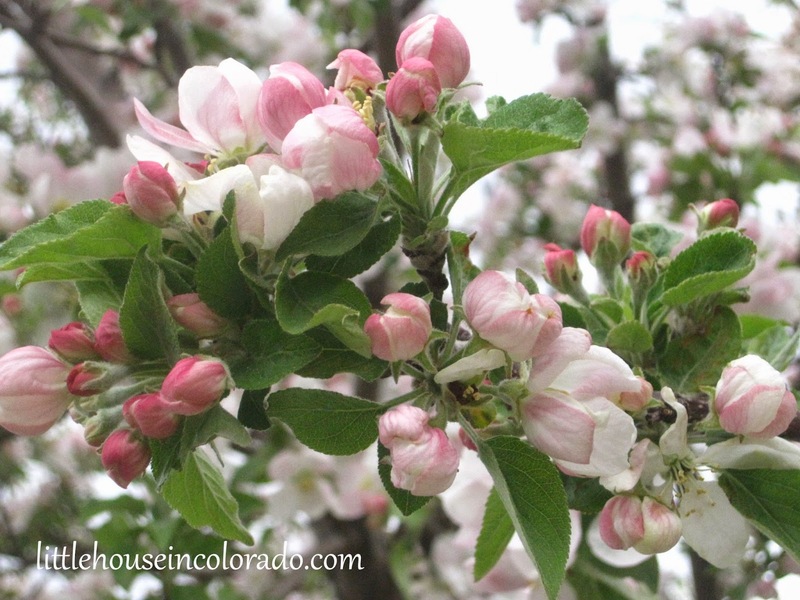 I think it's a game that Mother Nature plays every Spring in Colorado. 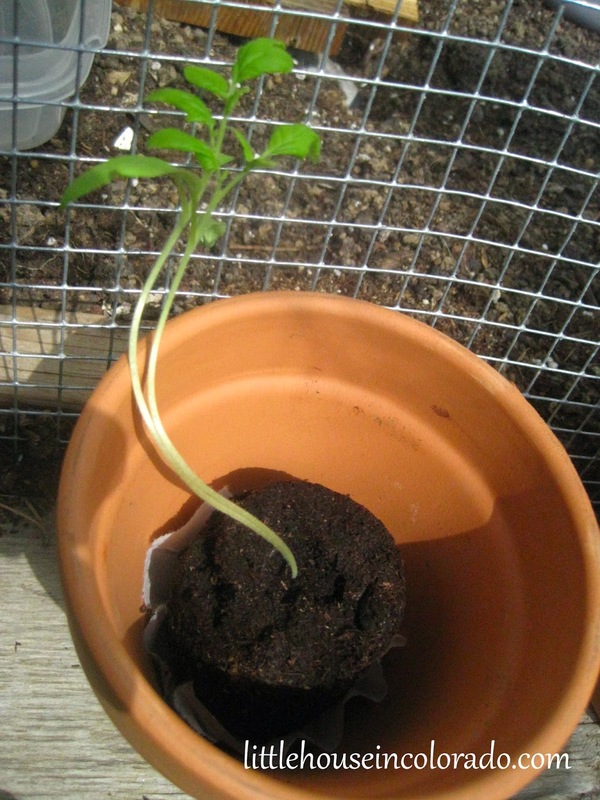 We potted up some of our tiny 4 week-old tomato seedlings. 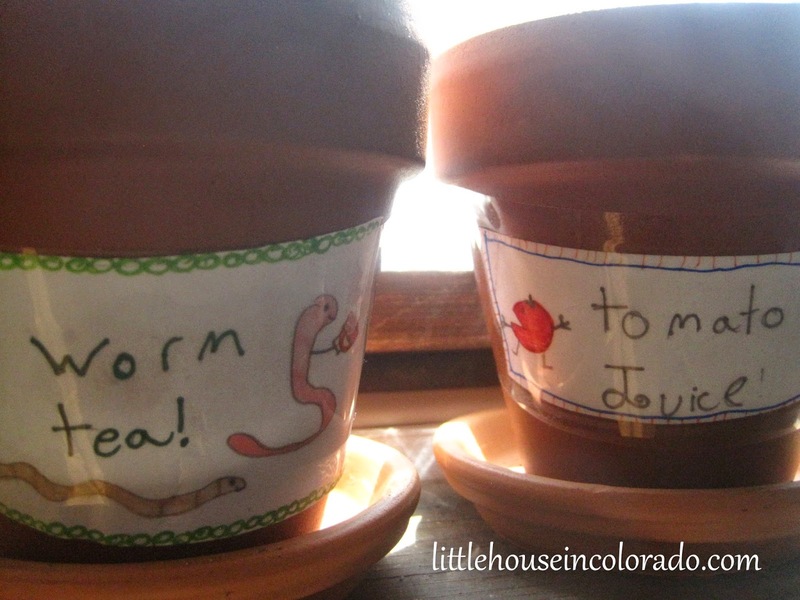 Now they're sitting in a window sill in little terracotta flower pots. They are labeled and ready to be experimented on in the name of science. I used to work for a small mom and pop restaurant in North Carolina that served up the absolute best food! The owner sold the business to someone else and I stuck around for a bit after that but soon moved on. The restaurant isn't in business anymore but the memories of the food live on. One of my favorites was the Tuesday Special...the Marinated Ribeye Steak Sub. I would order this for lunch every. single. week. It was thinly sliced ribeye, marinated in a heavenly blend of secret ingredients, then grilled and served on a soft roll with melted cheese and your choice of the usual burger-type toppings. I've attempted to make my own version of the Tuesday Special and while it isn't quite the same, my version comes close enough that I don't miss the original so much. If you want to double the recipe to serve 8, you do not need to double the marinade recipe. 1 lb Beef Steak, cut into thin strips - this can be ribeye, flank steak, beef for stir fry....I usually just pick up what's on sale. Sometimes it's just under a pound. Sometimes just over. But we don't mind leftovers in this house. 1 Medium Onion, sliced - in halves, not rings. Cheese of your choice - about 4 - 6 ounces, grated. I usually use Monterey Jack or Mozzarella. Cheddar and Provolone would work well, too. 4 Sub Rolls - split but not cut all the way through. Toasted if desired. Sandwich toppings - mayo, mustard, lettuce, tomatoes, etc. Combine all marinade ingredients and mix well. Place beef strips into a small mixing bowl. Pour marinade over beef strips and stir lightly to coat. 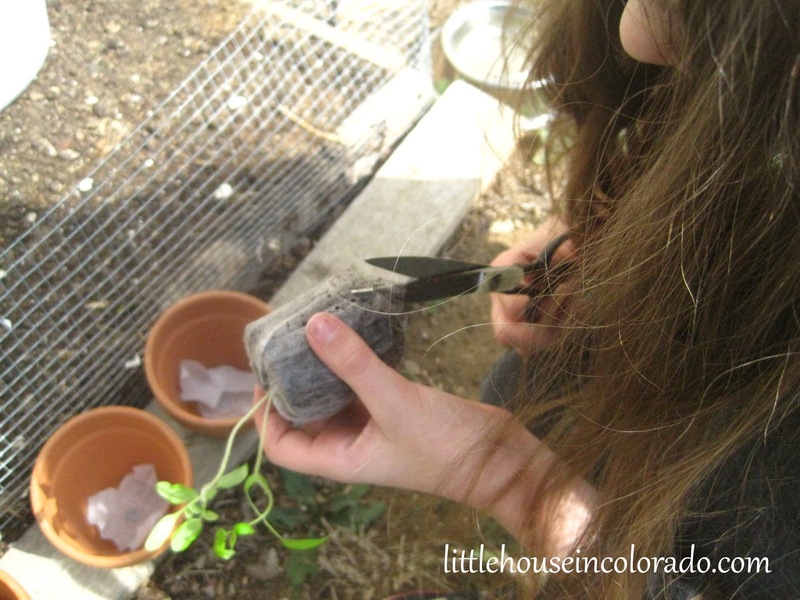 Cover with saran wrap and place in the refrigerator for at least one hour. Heat skillet over medium heat. Pour beef strips and marinade into the skillet. Brown beef. Add onion slices and cook until clear. Divide beef and onion mixture into four sections in the skillet. Place 1/4 of the grated cheese on top of each section. Place lid on skillet and keep covered until the cheese is just melted. Serve one section of beef and cheese mixture on each sub roll. Top as desired. Serve with choice of sides. Here, we opted for fresh fruit and Homemade Potato Chips. Enjoy!